Why do voters choose to raise their own taxes for public transportation? Should we expect this political willingness to finance to transit to change travel behavior? 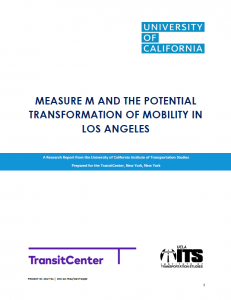 This project examines those questions by analyzing Measure M, the sales tax increase that LA County voters approved by ballot in 2016. Measure M was designed to be transformative, and help make LA a more multimodal region. I show first that this goal is ambitious: LA differs greatly from the American regions where transit use is more common. I then use two original surveys to examine the reasons for Measure M’s support. I find that the reasons for supporting Measure M were often partisan, and/or related to beliefs about transit’s ability to improve social problems. Supporters of Measure M exhibit little appetite for riding transit, and little interest in the complementary policies (more density, less parking, congestion charging) that would make new transit investments more effective.